As soon as I saw a recipe for homemade hummus posted on I Will Not Eat Oyster’s blog, I knew I had to give it a try. Hummus is one of my all time favourite dips (it’s main rival is guacamole). I knew if I was going to spend the extra time soaking the chickpeas, it was going to be the centrepiece to a very special dish. I wasn’t going to just snack on it with vegetables or sneak a thin layer into a sandwich (which I also did with leftovers), I was determined to make this hummus the star of the show. And it is. A thick layer of creamy, lemony hummus is the base for this entire dish but it’s the combination with everything else on the plate that makes it the ultimate hummus. 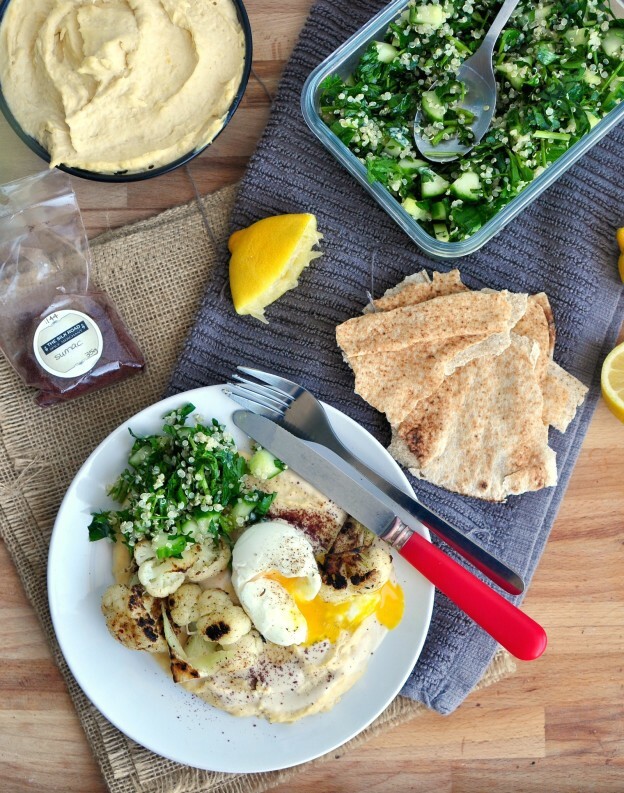 If you are ever going to make hummus into a meal, this is how you do it. I have been making my way through the leftovers of this for a whole week and am not complaining. This entry was posted in Appetizer, Condiment, Main, Salad, Side dish, Vegan and tagged cauliflower, egg, egg recipe, food, gluten free, gluten free recipe, Healthy, healthy dinner, healthy dinner recipe, healthy recipe, hummus, hummus recipe, middle eastern, recipe, Salad, salad recipe, sesame, sesame recipe, soft boiled egg, tabouli, tabouli recipe, tahina, tahini, tahini recipe, Vegan, vegan recipe on January 24, 2016 by mysecondbreakfast.